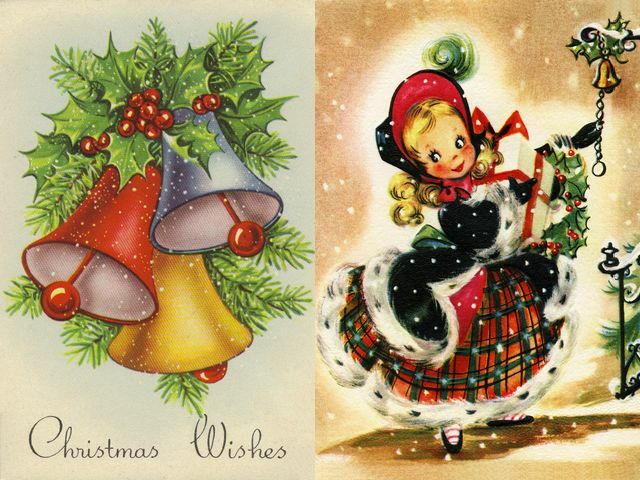 Beautiful vintage cards with Christmas greetings and wishes, depicting Christmas bells with Holly and an adorable girl with gifts. Christmas bells are associated with the spread of good tidings, joy, peace and a call to prayer. Holly is a shrub with spiny leaves and red berries. Pagans thought that the leaves of the Holly, which remain green throughout the year, are a promise that the sun would return, and symbolize a home in which Christ's birth is celebrated. The first Christmas gifts were given to a Baby Jesus by the wise men.